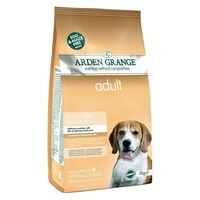 Arden Grange Adult Dog Food (Pork & Rice) is a wholesome and complete diet for small and medium breed dogs with normal activity levels. Containing Pork as a nutritionally valuable source of protein and a rich source of Zinc, Selenium and B Vitamins, this Arden Grange recipe is a delicious and highly digestible alternative to Chicken based diets. It is also free from Eggs and Maize, which makes it perfectly suitable for dogs with Chicken, Egg or Maize allergies and/or intolerances.